Weightlifting Fairy Kim Bok Joo tells the story of athletes on a college campus trying to achieve their dreams and follows the weightlifting journey and first love experience of a young woman named Kim Bok Joo. Weightlifting Fairy Kim Bok Joo is very much a slice of life story on a college campus. The drama has some nice humor with lots of heartwarming moments as it portrays the students working hard to succeed in their individual sports. It also really highlights both the good and bad that comes with being a top athlete. Lee Sung Kyung was great as our Weightlifting Fairy Kim Bok Joo. Bok Joo is a bit frumpy and awkward. Her personality comes off a bit tough, but really she is super sweet and innocent. 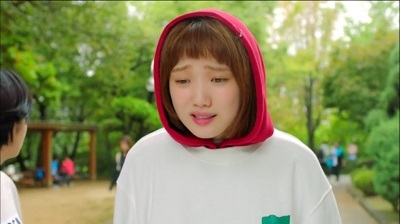 Lee Sung Kyung makes some truly wonderful and hilarious faces that really make this character enjoyable. Although some of the first love experiences she goes through are very relateable, I actually had a hard time actually relating to her character. In the midst of an otherwise pretty realistic drama, she seemed like a bit of a caricature to me. But even without being able to really relate to her, I did still enjoy her as a character. 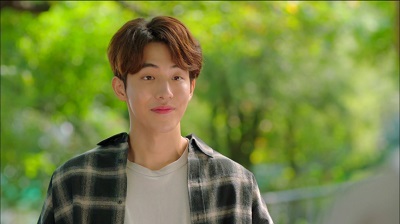 Nam Joo Hyuk was a lot of fun as Joon Hyung. He’s outgoing and confident with a sort of childishness to him. 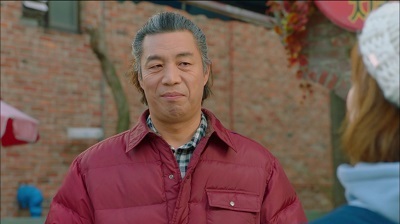 He was easily my favorite character in the drama. He’s such a genuinely nice guy that you can’t help but root for him in everything he does. I really enjoyed the relationship between Joon Hyung and Bok Joo in the first couple episodes. 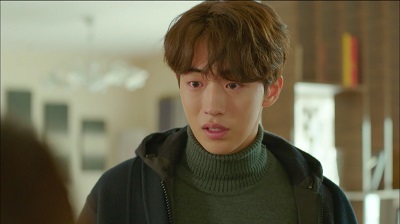 But then it felt like it took a backseat to some of the other happenings in the drama especially as we go on Bok Joo’s one-sided journey of first love with Jae Yi. Finally, around the halfway point, things really improved in the relationship department. Joon Hyung becomes a real friend to Bok Joo which soon turns into romantic feelings. He becomes very protective of her and only wants to see her happy. He also loves her for who she is. I definitely perked up seeing his passion and caring for her. I would call the romance between Joon Hyung and Bok Joo cute. There is a lot of playfulness and fun that provides a lot of humor. I didn’t find it swoon-worthy in any way though. It also didn’t really have that push and pull dynamic that I like. It takes a long while for them to move through the stages of annoyance, to friends, and to lovers. And then things are pretty simple aside from some small misunderstandings. I just didn’t feel any high stakes between the two and their relationship. But they are still unbelievably adorable, and their strength comes from how natural they are together. They are about as cute as can be! Song Shi Ho (Kyung Soo Jin) is a rhythmic gymnast at the school and the ex-girlfriend of Joon Hyung. 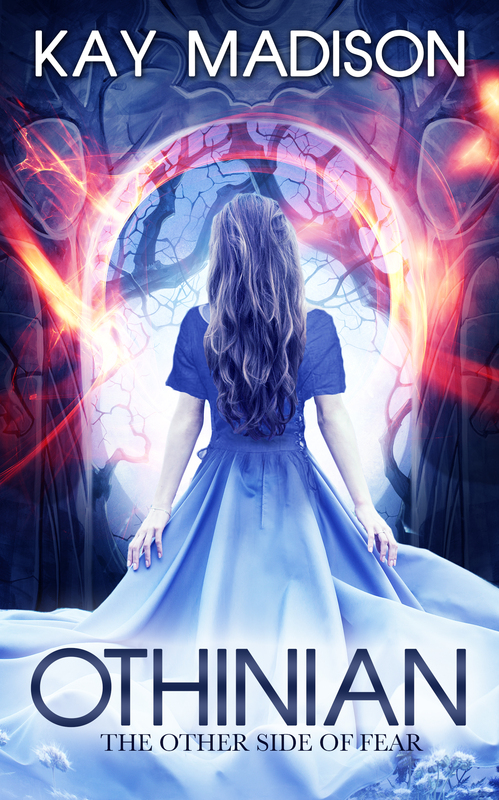 We watch her as she battles her own inner demons as well as anorexia and bulimia. I liked that the drama actually highlighted how difficult her struggle was and how seriously it affected her. But after she hits a serious low in life, I really disliked how quickly her problems seem to resolve. Her character basically does a complete 180 that I thought minimized much of what she had been through. Jung Jae Yi (Lee Jae Yoon) is the kind-hearted doctor that becomes Bok Joo’s first love. He’s a little bit too nice for his own good which is what causes Bok Joo to fall head over heels for him. And he has several of his own issues to deal with stemming from is overly friendly personality. Of course, I loved my favorite ahjussi, Ahn Kil Kang, as Bok Joo’s dad. He’s a gruff character, but he loves his daughter and only wants her to be happy. He had a fun dynamic with Bok Joo’s uncle, Dae Ho (Kang Ki Young). He’s important in keeping Bok Joo’s dad reigned in. Bok Joo has great relationships with her two girlfriends, Nan Hee (Cho Hye Jung) and Sun Ok (Lee Joo Young). This trio is very close with one another. They share everything with each other, and these girls are an important support for Bok Joo. I do feel that the drama moved along pretty leisurely for my tastes. For me, this was mostly due to there not being a grander plot running in the background. It really does just focus on Bok Joo and her first experiences with love. And that’s not a bad thing, it just feels a bit too normal in many ways. Most of the characters also feel pretty one dimensional. Although characters reacted emotionally to difficult situations, the conflicts felts very surface level. Even the characters that had serious issues to deal with, such as Shi Ho, felt like that was all there was to them. For the most part, everyone just had their role to play. I do think Joon Hyung had some depth with the pain he was carrying around from his mother abandoning him. We do explore that for a small portion towards the end of the drama, and I found it a nice change of pace. I wish we could have explored the other characters on a deeper level more similar to this. I did enjoy the sports theme of the drama. I’m not big into sports, but I really enjoy the Olympic sports like swimming and gymnastics. So this fit that perfectly. I think the drama captured the atmosphere of being at a sports university well, but I would have loved to have seen more actual competitions for the students. Since the drama focuses more on their personal lives, I didn’t feel to invested in their actual competitions. But overall I was happy to see sports incorporated into a drama. Weightlifting Fairy Kim Bok Joo is a fun and inspirational drama on many levels. While I did find it a bit slow overall and would have liked to have seen a bit more story, it still had plenty going for it. Joon Hyung and Bok Joo are super adorable together and are the best thing about the drama. If you like cute couples, slice of life stories, and dramas without a lot of angst, Weightlifting Fairy Kim Bok Joo is a perfect fit. This entry was posted in Reviews and tagged Ahn Kil Kang, Kang Ki Young, kdrama, Korean Drama, Kyung Soo Jin, Lee Jae Yoon, Lee Sung Kyung, Nam Joo Hyuk, Weightlifting Fairy Kim Bok Joo, Weightlifting Fairy Kim Bok Ju. Bookmark the permalink. I really like slice of life dramaseries, and don’t mind things being slow (as long as they are not toooo slow lol). I really do like the story for this one, and hopefully will find a time where I can watch this one. Great review. – The cinematography and OSTs were really good; way better than most other shows. The only thing lacking in this series for me was that it did not really offer intrigue in the story. I mean, the story was okay. But I want to be constantly on the edge of my seat.